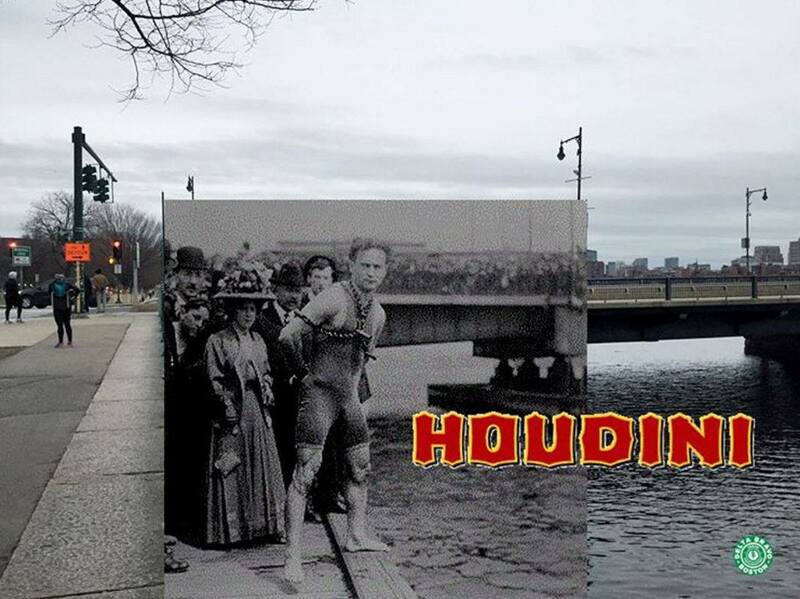 The Boston Chapter of The Delta Bravo Urban Exploration Team -- "a collective of individuals that seek to find location detail for pop culture" -- have pinpointed the exact location of the famous photo taken of Houdini during his jump from the Harvard Bridge in Boston on April 30, 1908. I love "then and now" shots like this. One thing this image immediately reveals is that the photo was not taken moments before Houdini made his leap into the river, as one might suppose. It was taken either before or after the stunt as Houdini (and Bess) are not even on the actual bridge from where the jump was made. No doubt having the bridge in the background made for a better photo op. 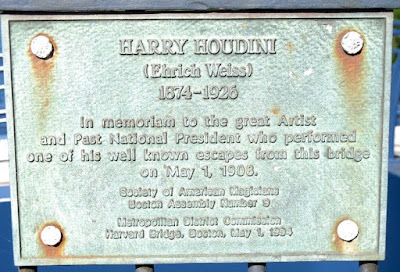 Below is a shot of Houdini's jump from the bridge itself. Houdini was performing at Keith’s Theater on Washington Street at the time of this outdoor stunt. 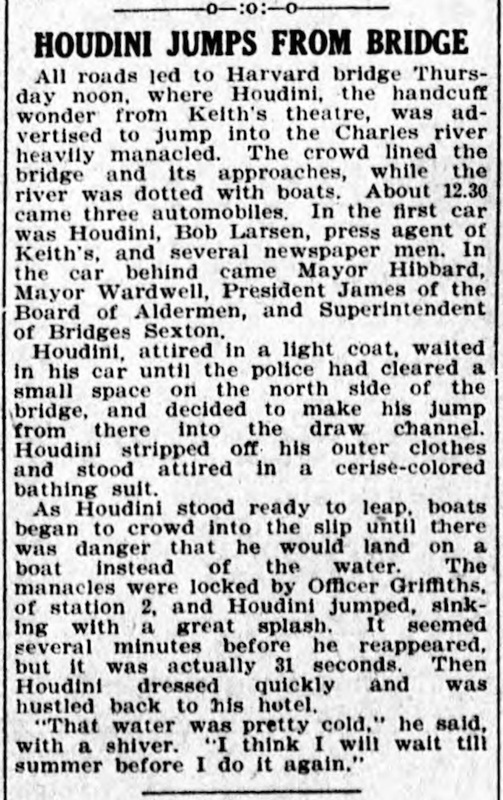 The Cambridge Chronicle (below) offered some nice details, including that Houdini wore a "cerise-colored bathing suit." This is second time I've heard of Houdini wearing a red(ish) bathing suit during a bridge jump. It makes sense. This would help Houdini stand out in the massive crowd, and help rescuers better spot him in the water should something go wrong. Color of Houdini's bathing suit. 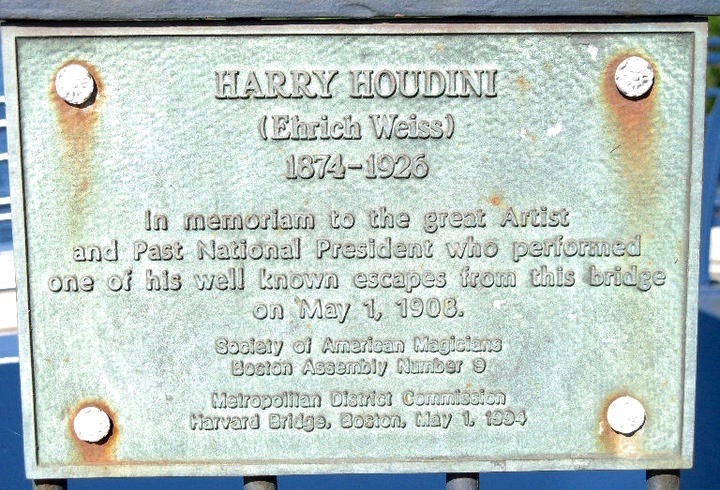 Houdini's leap from the Harvard Bridge is one of his more well-known bridge jumps, not only because of the excellent photos taken that day, but there is also a plaque commemorating the escape placed on the Boston side of the bridge by the Boston chapter of the Society of American Magicians in 1994. Unfortunately, this plaque incorrectly dates the escape as May 1, 1908. The escape actually took place on April 30. But at the time the plaque was made, Milbourne Christopher's Houdini The Untold Story was still the most authoritative biography on Houdini, at that book misdates it as May 1 (the date on which most papers reported the event). The first book I found to contain the correct date is 2010's Houdini Art and Magic by Brooke Rapaport. Plaque photo from The Cambridge Historical Society. The color of Houdini's bathing suit? Nice work John. So the colorized version with HH in the Navy Blue suit was wrong? Has anyone done a colorized version of this photo with a redish suit? Yep, that image was wrong (ironically, Bessie's dress is cerise). I've never seen another colorized image. Don't think anyone knew the color to get it right. Bill Mullins sent me a newspaper account that contained another nice observational detail. When Houdini was asked if he was ready, the paper reported that he said yes "in a strong accent." HH had this stunt down to a science: Show up in car, get out, remove outer clothes, get shackled, jump, dry out, put back clothes, head back to the hotel. A few VIPs showed up for this jump. In the Boston Post account that Bill sent me, it said that after the jump Houdini was "taken into the pier cabin, where he was given a rubdown." I haven't read that in any of the other newspaper accounts. They all say he quickly left. I saw a newspaper account, that made reference to a light swimming suit and that right before the dive, he sang out: “All right, boys I’m coming!” and made the dive. Apparently, Mayor Hibbard, of Boston and Mayor Wardwell, of Cambridge and party witnessed the feat. WRT when the photo was taken, according to Christopher’s book, Houdini The Untold Story, Bess arrived late for Harry’s jump. Yeah, I didn't go into it, but the oft-told story is that Bess was late and when she told the police she was Houdini's wife they said something like, "Lady, you're the third wife today" (or something like that). Maybe true. But also maybe a little too cute to be true. However, this is somewhat corroborated by the above news account that doesn't mention her arriving with Harry. This helps support the idea that the pic was taken after the jump. I've also always thought Houdini's legs look wet in this pic. But if this was posed for photographers after the stunt, why are there still so many people on the bridge? "Light bathing suit" might refer to the color (and I think cerise could be considered light), but when I first read that, I thought it referenced to the style of the bathing suit as being a "lightweight" athletic bathing suit. This is really great. Love the "then and now" shot. In my opinion, this pic looks like it was taken before the jump. His hair appears dry, the crowd seems to be waiting, and the chains are all in place. Of course , all this could’ve happened after the jump and the chains re-applied. But the newspaper article says, “…Houdini dressed quickly and was hustled back to his hotel”. And, in the last paragraph, “That water was pretty cold,” he said with a shiver….”. This makes me think that once he got out of the water, he wanted to get back to a warm hotel room, not take a photo. Yeah, I'm thinking the most likely scenario is he was manacled here where the photographers and VIPs watched, then was escorted by police out onto the bridge and platform. In one account it talks about how HH had difficulty getting through the crowd to the jump spot. It didn't say he was in chains at the point, but he probably was, hence part of the difficulty. Also thinking this same photographer stayed put and also took the pics of him jumping. Appears to be from the same spot. I have in my research material some nice photos of the above plaque with me when I(happily)found it for the "1st" time many years ago during an S.A.M Annual Convention in Boston, MA! 1910: Houdini's flies at Rosehill. First controlled flight in New South Wales. Thrown from plane on second flight hard landing. "Houdini must have been crazy to do this." When did Houdini become "King of Handcuffs"? "A Houdini for the Millennium"